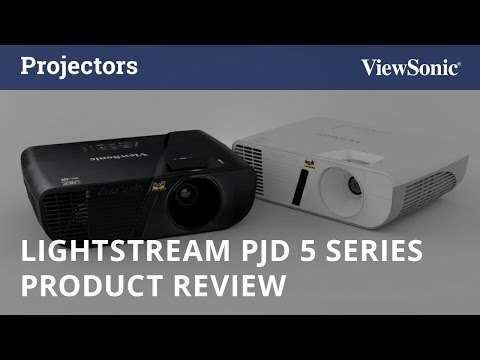 The ViewSonic networkable LightStream™ projector PJD6352 features 3,500 ANSI Lumens, native XGA 1024x768 resolution, majestic style and thoughtfully intuitive design. Exclusive SuperColor™ 6-Segment Color Wheel maximizes color saturation and brightness for true-to-life image projection in any light, while SonicExpertTM, ViewSonic’s proprietary sound enhancement technology, powers a 10W speaker to deliver incredibly clear and audible sound. PortAll - a neatly designed enclosed HDMI/MHL connection compartment, supports streaming media from wireless HDMI dongles or MHL connectors, while a cable management hood connects onto the back of the projector and eliminates unsightly cable clutter. With HV keystone, corner adjustment, 1.3x optical zoom, shorter throw ratio, and easy network management, the PJD6352 provides flexible setup. Designed with smarter features and extensive connectivity, the networkable PJD6352 is ideal for use in education and corporate environments. ViewSonic’s proprietary SuperColor Technology offers a wider color range than conventional DLP projectors for true-to-life color performance in any light. SuperColor™ 6-Segment Color Wheel maximizes brightness Increased by 15% or more with the highest color saturation over others in the same class. Packed with 3500 ANSI Lumens and a high contrast ratio, the PJD6352 is guaranteed to produce bright images in any environment – even in rooms with high ambient light. Our unique ViewMatch picture mode delivers the optimum brightness and color for everyday projector use. This projector includes ViewSonic’s exclusive Portal feature—a hidden compartment with an integrated and secure MHL/HDMI port that lets you discretely stream multimedia content from a wireless dongle, or lets you connect to other devices via an HDMI cable. Equipped with a 1.3x optical zoom lens, this projector provides mounting flexibility with a wider throw distance range. With a 1.5 shorter throw ratio, this lens can also project large images from short distances in small rooms. And with a throw ratio ranging from 1.51 to 1.97, this projector can effectively replace typical DLP and 3LCD projectors without having to move or re-install existing projector mounts. ViewSonic’s exclusive SonicExpert technology incorporates a ported speaker chamber and a more powerful amplifier to deliver higher volume and the absolute best-in-class sound. ViewSonic’s SonicMode offers three presets for different applications. Standard: offers the best sound levels for general use. Speech: enhances the sound of spoken words, making it ideal for projecting speeches and lectures, or for sales calls and video conferencing. Entertainment: delivers more bass and richer mid-high frequencies ideal for music and movies. Equipped with two HDMI ports, this projector can display 3D images directly from 3D Blu-ray players—perfect for connecting to any HDMI-enabled devices such as PCs, laptops, tablets, and media players. An integrated thermal sensor intelligently controls fan speed, reduces noise, and saves energy, while air flows freely through the projector for quick and efficient cooling of the lamp.